Assam Power Generation Corporation Limited (APGCL). 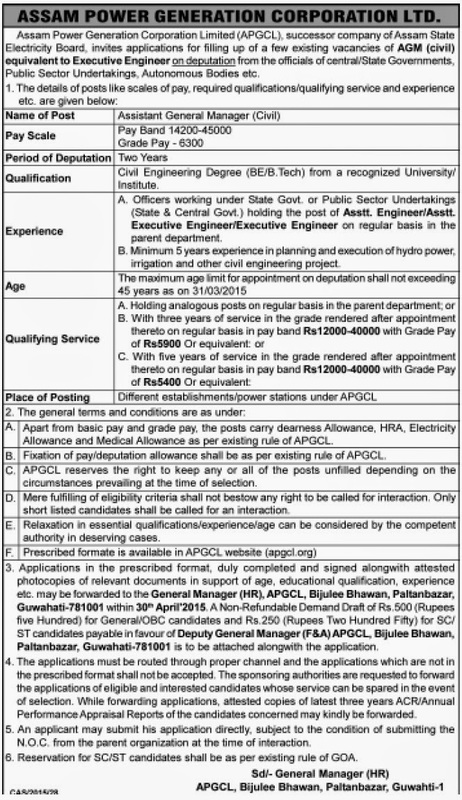 Assam Power Generation Corporation Limited (APGCL), successor company of Assam State Electricity Board invites applications for filling up of a few existing vacancies of AGM (Civil) equivalent to Executive Engineer on deputation from the officials of State/ Central Governments, PSU, autonomous bodes, etc. Age limit : The maximum age limit for appointment on deputation shall not exceeding 45 years as on 31/03/2015. Qualification : Civil Engineering Degree (BE/B Tech) from a recognized University/ Institute. A. Officers working under State Govt or Public Sector Undertakings (State & Central Govt) holding the post of Asstt. Engineer/Asstt. Executive Engineer/Executive Engineer on regular basis in the parent department. B. Minimum 5 years experience in planning and execution of hydro power, imgation and other civil engineering project. How To apply : Applications in the prescribed format, duly completed and signed along with attested photocopies of relevant documents in support of age, educational qualification, experience etc may be forwarded to the General Manager (HR). APGCL, Bijulee Bhawan, Paltanbazar, Guwahati-781001 within 30” April‘2015.